Despite the horrendous transportation travel stories from the past few weeks, we have exciting street news to share. Example of a protected bike lane. After years of advocating for a balanced redesign plan for Commonwealth Avenue, the city has now agreed to a safer, more livable design that includes protected bike lanes! As yesterday's Boston Globe reported, "The city went back to the drawing board after an outcry by advocates, media criticism, and an impassioned public meeting two months ago at Boston University where more than 100 citizens showed up despite a nor'easter." For years, LivableStreets has been saying no to Boston's inadequate plan for the redesign of Commonwealth Avenue that designed for car traffic at the expense of biking, walking, and transit. Thanks to over 1800 signatures and stories collected by our Street Ambassadors, and a strong coalition -- including LivableStreets, Boston Cyclists Union, WalkBoston, MassBike, and BU Bikes -- Boston and BU officials went back to the drawing board. Thank you City of Boston! LivableStreets co-founder Jeff Rosenblum presenting a vision for a Comm. 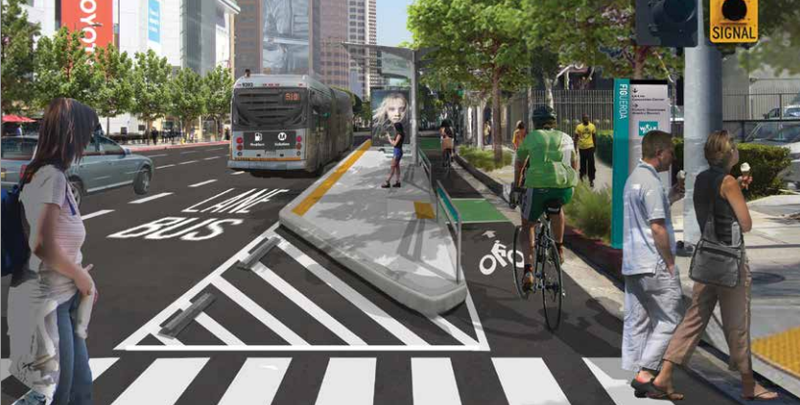 Ave. that prioritizes walking, biking, and public transportation. While thrilled with the news, this project is not yet complete. Stay tuned: we expect the City of Boston to hold a public meeting to share their latest plans in the next month. We will continue to work with the city and our partners to ensure pedestrian and traffic calming improvements are included in the new design and push for a concrete commitment on transit priority for the Green Line and buses. And we will be pushing for better clearing of sidewalks and bike lanes in winter! For more information, check out our project page. While this victory is very exciting, and it is news to celebrate, Comm. Ave. is just one piece of Boston's transportation puzzle. LivableStreets staff, members, and volunteers are active 365 days a year working to create more livable streets. Have you renewed your LivableStreets membership for 2015? Or not yet a member? No better time than the present! Sign up today. Action e-lert: How do you envision getting around Boston in 2030? e-lert: Comm Ave public meeting on Tuesday! Action e-lert: Comm Ave public meeting scheduled: March 24! We're hiring + Welcome new staff and board! What does Yes on Q1 mean for you? 100 yesterday, 440 expected tomorrow!